I had a haircut this weekend and instead of seeing the usual stylist who cuts my hair, I went to a special section of the salon and had my hair cut in the "In Store Barber Shop". It was pretty cool. Set apart from the rest of the salon, there were old school barber chairs, flat screen TV's, yadda yadda. It was like a man cave hidden in the hustle and bustle of a very busy salon. When the service was nearing the end, and the stylist (or I guess we'll call him a barber) came to trimming my neck hair and side burns, I had a surprise. Instead of breaking out the mini buzzer like my usual stylist does, the man cave guy broke out the hot lather machine and a straight razor. Sure, flashes of Sweeney Todd went through my head, but in the end, I loved it. Hot lather rules! And as odd chance would have it, Pure Spa Direct JUST ADDED a very economical Hot Lather Machine from Scalpmaster... the "Lather Time Professional Lather Machine". 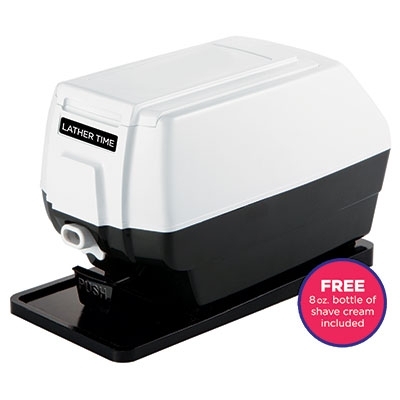 It features a push button for easy dispensing, an extra large soap cup for an all day supply of warm lather and a long lasting DC motor. It also includes a non-slip safety pad, a cleaning brush and an 8 oz. bottle of liquid shave cream. Pretty cool old school stuff.